Though steeped in sounds of the past The Cactus Blossoms simultaneously bring a refreshing infectious energy to today’s Americana music scene. Brothers Jack Torrey and Page Burkum learnt their trade playing local small bars and gigs performing songs thirty years or more older than themselves. Ranging from classic country to traditional folk ballads by way of tongue-in-cheek obscure heartbreakers, nothing was too quirky for the Minneapolis boys. Signed to local roots label Red House Records, Torrey and Burkum came to the attention of a larger audience through their Red House debut “You’re Dreaming,” and through the work of the label saw attention grow daily. 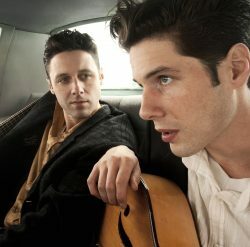 Previously the boys had relied solely on word of mouth and their self-released albums, “Live At The Turf” from 2013 and the self-titled record “The Cactus Blossoms” from 2011. You have a most exciting new sound. Where do your greatest influences lie? On listening to your music I detected hints of the Everly Bros, the Louvin Brothers, Ricky Nelson and the 1960s folk scene all wrapped up in one. Jack: Yeah, that’s about right. A lot of those things are definitely influences. Probably it’s a combination of everything you mentioned and a little bit of mysterious stuff we found by accident. Am I correct in thinking first off you just got together to play songs on a nightly basis at local venues, performing for the love of it? Jack: Absolutely. Yeah, we never really planned on hitting the road and touring as much as we have. We never thought that was ever going to happen – we started off playing round Minneapolis and St. Paul area and doing a lot of gigs. We also had a regular gig we started to do here in town (The Turf Club). Yeah, we were just messing around and playing whatever songs we were getting into, and tried to make them our own, and generally just have fun with them. From there it just kept going. Now we are playing all over. Who are the early people you got into; was it the songwriters or just the songs? Page: I think Jack and I have both gone through different phases of listening to different people. I know there was a time when I started playing a little guitar and was learning songs (“and it was a little guitar by the way” interrupts Page). It was this little cheap guitar I saw at a thrift store and it sounded okay, it was at least good enough to learn on. Anyway, at that time I found out about artists that I knew nothing about growing up, people like Jimmie Rodgers, and I had not really heard much Hank Williams. Just classic country and folk stuff, also guys like Woody Guthrie. All of those artists play so many songs that come out of the folk tradition that they did not write but also sang. There also wrote a lot of great songs too, and most of them only had three or four chords to them so that was a good way for me to start playing and learning songs. I think the lyrics in folk songs are quite inspiring too. It is fun to hear people write a good song but it also a good learning experience to hear the lyrics in folk tunes and how they were formed and the evolution. You talk with great affection about the old folk songs that have been passed down from one generation to the next, apart from those that have repeatedly crossed back and forth, the Atlantic. Hence some songs have a few different versions? Jack: Yeah, it’s like the game of telephone. Where you say something to one person and they miss hear it a little bit, and that still happens to everyone. There are songs that we have learned to play in our band, and I will go back to the lyrics and listen to the original track that we learned it from and a year or two later and realise I have accidentally changed a lot of words (Laughs). Just little things, but it is interesting how that happens without even trying to a degree. A lot of the old songs from the likes of Hank Williams and Roger Miller were story-songs that squeezed in a memorable story in a very short space of time? Page: True. Their songs were a little bit more obvious, and the lyrics were a little bit easier to understand, you got the idea of the song in about thirty seconds. The music you do has this good to be alive happy feel, even where the lyrics are a little darker. On just hearing you on record the listener obtains the impression that you love playing live? Jack: Totally, one reason is we perform songs of a happier sound without bumming out people too much when we do sing a sad song! Making this album, your first professional studio record after your self-released records for someone like Red House was quite a jump, how did you come to sign for them? Jack: Red House Records they have been at for thirty years or so. Is that right Page? They are based out of the Minneapolis St Paul area our hometown area. So it is a pretty neat thing to hook up with a label that’s local. It’s a big world out there, so it is cool that we can work with someone in town. We have been friends with them for years now, and just over a year ago signed a record deal with them, and it’s been just great Page: It’s a big company. How did JD. McPherson become involved with the record? I know you were on tour with him? Jack: Yeah, we just played a couple of shows with him – one in Minneapolis and started seeing him round the country as different festivals and stuff. We probably played with him for the first time about four years or so ago, and we just started talking about how we were going to make a new album and he was interested in being part of the project, and helping us out and the rest was history. Page: We had a lot of fun lining up everybody’s schedule so we could record in Chicago and them all being there. Page: We wanted to work with a drummer, which is something we had not done before and there is this very talented musician named Alex Hall. Not only is he a great drummer but a great engineer, so he did double duty on the album. He played drums and recorded it. We just wanted to work with this group of guys in Chicago. Joel Paterson guitar, Alex Hall and Beau Sample on bass. That’s about it. When you first went into the recording studio did you have all the songs ready? How long did it take to make “You’re Dreaming”? Jack: We had a lot of the album finished, but there were a couple of songs we put finishing touches on five minutes before we recorded them! I think in all we did about seven days of recording that was spread over a few months. The hardest part was getting everybody in the same room on the same day. So we had to do a bit of planning. We took our time when we could, but it was a pretty fast paced recording project (Jack). You seem to enjoy what you did. It isn’t overproduced to the degree all the life is drained out of it. The record retains a genuine feel of spontaneity to your music, with a little bit of it being on the edge. You have this bubbly sound, which is one of the things I love about your work? Jack: I am glad you like our lack of polish (laughs). We don’t know how to do that. Page: Seriously, that is a huge compliment. There is one remark you made in an interview of how you see JD McPherson as a music connoisseur; can you enlighten me on that? Page: Oh, he has this encyclopedic knowledge of music. He knows about so many musicians, producers and engineers, and who did what on what record. He has got a knack for remember stuff like that, and it was great fun to have him on the record. He will jump out of his seat and say yeah! I remember hearing it on some record, and he will then play it for us. Jack: What we are trying to say is he’s a big geek! (Laughs). But, he is a really cool geek. One of those geeks you like to have around! JD has really good taste. The opening track on the record “Stoplight Kisses” is a fantastic song to kick off the record. There is so much energy and fun to the song? Page: It’s a funny one (laughs). Jack: I wrote that one, I wrote it quite a long time ago. It is pretty funny the way it keeps on having a new life, it was fun we got a good recording of it with these guys. Yeah, it is a very raunchy song you know! Which one of you wrote “Change Your Ways or Die (The Buffalo Song)”? Jack: It is another of mine. I notice it is also on your live record? Jack: Sometimes you have to record songs a couple of times to get them to sound right. We took another go at it and this time make a studio recording of it. It is kind of the apoplectic track on the album. When you were growing up did you play much music together, or was this something that came along later? Page: We did not play together really at all till about six or seven years ago. We lived together for a little bit, it was in a little duplex. At the time we were pretty much holding down part time jobs and listening to lots of music and playing with different friends in town who were also playing in bands. That was when we started playing together. When you did start out who was the real guitar player? Page: (laughs) neither of us. We are still working on it. We have an older brother who has been playing guitar since he was young (called Tyler). He plays better than us, and we have had him play some lead guitar with us. You have this older sound perfected, and for this album you brought in fiddle and pedal steel guitar to go with your great harmonies? Jack: Yeah, we used to have fiddle in our band, but changed things up this last year when started focusing on songs from the album, and brought in electric guitar. There is of course a lot of steel guitar on the album. It’s interesting how different instruments can pull your music to different directions. With someone like JD McPherson involved the music can take on a new dimension? Page: Yeah, we were ready for a change. I think we were going to change our sound a bit, anyway. He just came along at the perfect time to help us figure out what we wanted to do, we couldn’t have picked a better time to meet JD. It broadens your base and at the same time brings a new challenge with it? Page: Hopefully, we will continue to broaden our base and as they say think outside the box change direction. When it comes to writing the songs, do you sit down together or does it start more organically through a lick or a phrase comes to you without working on it? Jack: It seems there is a thousand different ways a song can show up at your door. There is no given process. Sometimes I’ll have an idea and Page and I we’ll get together to work on the harmony parts, and we’ll figure out how to play it and take it from there. Other times we may have a little lick lie round for a year that does not belong to any song before eventually a song will come up, and we will make our own thing out of it. We don’t have a song lab yet (laughs). Page: We have never got together and tried to write a song, we have never tried to force a song out like that. Sit down together with a plain sheet of paper. Work on it like a homework project, we just have not done that. Even if it is only a small idea or piece of a melody I think it is better than trying to work entirely from scratch than have to force it. I imagine it takes patience doing it the way you write. Waiting for that inspirational moment. I believe doing it the way you do will make the song feel closer to your heart? Page: It does take some patience doing it this way, like you say waiting for the inspiration. Sometimes it gets a little frustrating. I do wish I could control it more, but I will take what I can get. Could you tell me about the song “Mississippi” – where did the idea come from? Jack: “Mississippi” is a strange one, one of the strangest songs on the record I think. I don’t know exactly where it came from. It has a bit of the It’s A Wonderful Life movie to it, like jumping into the Mississippi River and floating all the way down to the ocean. It is another sad love song I guess. How many players are in your band presently when you are touring? Jack: We are going to have four of us when we go on this tour in January. It will be bass and drums, and Page and myself on this January tour. We are so proud to bring a band over with us, have that additional sound because the last time we were over and toured with JD McPherson it was just the two of us, but this time we will have bass and drums it will liven things up. Highlights so far in your career. I notice you have played Newport Folk Festival and the Prairie Home Companion – that’s two iconic appearances to your name already? Page: Yeah, we did a lot of things in 2016 that we have never done before – it has been a really great year for us. How have you coped with all the extra dates and travelling? Jack: I think I will have to take up doing crossword puzzles to keep my brain sharp. Because waking up in a different town everyday, in a different club every night it does something to your brain, that’s for sure. Some of these older songs that weren’t originally duets – do they take much work before they can become, let’s say, harmony friendly? Page: I think I know what you are asking – yeah, I think that we have mostly just chosen songs that work easily for harmony. Even if we write a song that we feel isn’t well suited for harmony we just don’t try and put harmonies all over it. We don’t try to force that onto every song. It is fun to try and find a song that might not have been done with a lot of harmony, and then add it to it. Out of all the people you have listened to who have you learnt the most from? Jack: Oh, wow… (silence). I think musicians I know. Hanging out with them and watching them play their instruments and sing. They have been the biggest impact really. I have seen a lot of love music and a lot of people playing live the last couple of years than I’ve listened to recordings I think. I was just about to ask you that. I guess you will learn things along the way that you can adapt for your selves, give you ideas of how you can better your music. Jack: You have to steal the good stuff! Page: We are hoping to make a new record this year. That will be a big project to work on. We will be still playing shows, and working on making this record. Jack: Hopefully the songs will start pouring out. I saw the Cactus Blossoms at Hardly Strictly Bluegrass in San Francisco last October. They more than held their own on a stage with some pretty stiff competition. I hope the natives and the ex-pats come out in force to see them in the UK and Europe!